Set in Calgary, the Bone Cage is about two athletes determined to compete at the Sydney Olympics. Sadie Jorgensen is a 26-year-old long-distance swimmer who trains for six hours a day, works at the university gym for minimum wage and still lives at home. Digger is a competitive wrestler who at 31 is chasing his last chance at his Olympic dream. The story's point of view alternates between Sadie and Digger until their paths cross at the University of Calgary gym. Although their sports differ greatly, their commitment, focus and single-mindedness are very similar. In any other story, we would expect a relationship to develop, but we quickly learn that romance would interfere with their training and ultimately their goals. Early in the story, Sadie experiences the misfortune of losing her grandmother, suffering her first break in concentration and training. This, however, is more of a blessing in disguise, as it forces her to imagine what life might be like after the Olympics. The next break involves a car crash. Digger, the driver, escapes with minor scrapes and bruises, while Sadie sustains more serious injuries, and the second break in her training. I'm not one to watch sports on TV. The commentators' clichés and hackneyed metaphors grate on my nerves. This book, however, is well written, and as one of my colleagues pointed out, the author says a lot in very few words. She also performs the miracle of making wrestling interesting to the average reader--no small feat. Therefore, accessibility is one of the book's strongest points. I was also pleased to see that the main protagonist was a woman athlete because, sadly, the focus in sport is almost always on men. Besides, sporty girls and young women need role models like Sadie Jorgensen. The Bone Cage also showed the darker side of elite amateur sport and that fine line between determination and obsession. I'd always thought of amateur athletes as wholesome and committed, and until I read this book, I'd never considered how unhealthy it was to focus solely on something as elusive as the Olympics. This was well illustrated in Ben, Digger's wrestling buddy, who fails to qualify for the Olympic team and ends up in a psychiatric hospital, later turning to religion. I finished this book with a greater appreciation for the psychological fortitude elite athletes require, ability and experience aside. Overall, if the Bone Cage had not been a Canada Reads finalist, I probably never would have picked it up, but I'm happy that I did. It gave me a realistic picture of what makes an Olympic-calibre athlete tick. And if I could ask the author one question, it would be this: Why did you choose Sadie to be the injured party in the car accident? Digger continues his training and eventually goes to the Olympics. He feels some remorse and guilt about the accident even though it was not his fault. But life goes on...Sadie accepts Digger's choice and is not bitter about his decision. But if Digger's Olympic dream had been shattered by injury and Sadie had continued on with her Olympic dream would this book have been as well-received? I'd love to hear from anyone who has read the Bone Cage. 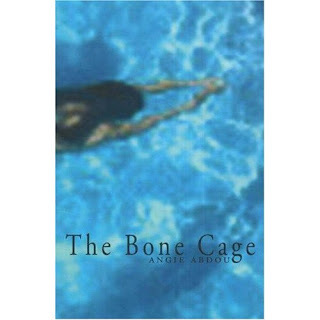 : The Bone Cage by Angie AbdouTweet this! I'm very pleased to announce that I have an answer to my question from the author, herself, Angie Abdou. I'd like to thank her for answering my question too. Thanks for the review and for the question. It's funny - I'd never even thought much about that issue until the whole Canada Reads event started. At the official launch, I spent the day with Georges Laraque and that was his first question: "How could you do that to Sadie? Why not Digger?" I got the same question again at the live chat and now from you - so that's three times in a couple months (after not getting it once for five years!). Georges feeling was that since Digger had already missed the Olympics twice, readers could more easily accept him falling short again - as if we were prepared for his failure. If that's the case, maybe I didn't want the reader to be prepared - maybe I wanted it to be shocking and heart-wrenching ... and maybe I realized that Sadie would be more so. Also (and this part was more conscious), I wanted Sadie (and through her the reader) to recover somewhat from the let-down and to have certain insights - insights that I'm not sure Digger is capable of. Sure, Sadie's athletic career has ended tragically and the adjustment is traumatic - but I wanted her to realize that no matter what, the ending of that career was coming (quickly) and was bound to be a rough transition, maybe even equally traumatic. Sadie articulates this idea at the end of the book when she realizes Digger's transition post-Olympics is going to be difficult (perhaps as difficult as hers has been) and that she will need to be strong for his return. She comes to the realization even earlier at the pool when she looks at her coach and thinks "So this is how it ended for him too." To me - that realization is crucial to the book. I don't think Digger would have coped as well as Sadie because he is more focused/driven and less introspective. Sadie always has her books. My reading of Digger is that he would have been devastated by an obstacle like the one Sadie faces. His recovery would have taken much longer. He therefore wouldn't have been able to arrive at Sadie's insights (and share them with the reader). "Another comment from Angie - I like your emphasis on Sadie as a role model for sporty girls and how we don't see a lot of women in sport lit. An academic (Susan Bandy from Ohio State) just gave a paper on female sport lit at a conference in Britain and focused on The Bone Cage and a novel called "Swimming" by Nicola Keegan (a novel I recommend)." Thanks again for taking the time to post your thoughts on my novel. It is true. In the statistics I read, girls reportedly give up competitive sports around puberty. We need a lot more pop culture references and role models to keep girls in sports.